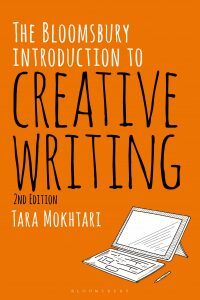 Tara Mokhtari answers some questions about the new edition of her book The Bloomsbury Introduction to Creative Writing. How is the The Bloomsbury Introduction to Creative Writing unique? There are two key ways in which my book is unique. The first is that the overall approach focuses on the connection between knowledge and creative writing. I am interested not only in craft, but also in how the creative process creates new ways into knowledge, and how refining and practicing craft can complicate our relationship to the world. The writing prompts in my book are designed to not only introduce creative writing techniques, but also to help students develop a relationship with their art. Being an artist is hard. There are times you feel helpless and like giving up. Part of overcoming the hard times is intuitive and trusting you are doing what you’re supposed to be doing. The other part of it is understanding deeply how this relationship between artist and art works, and actively finding strategies and habits to look after that relationship. The second is that one of my main goals with this textbook is to help to overcome the privilege that is inherently a part creative arts degrees. Over the years, many of my students have been the first in their families to go to college. I’ve had students who are immigrants, who are formerly incarcerated, who are veterans, who grew up in the projects, and who are ethnically and racially diverse. Perhaps forty years ago, if you undertook a creative writing degree, you could have expected to publish a novel or collection of poems at the end of it. You also probably would not have graduated with massive student debt. Things are radically different now. It is imperative for creative writing programs to both nurture minority voices, and prepare students with critical thinking, and practical, transferable skills for the job market. That’s what I wanted to do with this book, and that’s why I include chapters on writing for digital media, video scriptwriting, writing for virtual reality, writing for video games, and critique and exegetical writing. In order for creative writing programs to be inclusive, students need to be able to expect to graduate prepared for both industry and graduate studies, as well as investing in their development as artists. I used my own experience as a freelance writer to research these sections, and I interviewed professionals to understand what is expected of writers in up and coming creative media fields. What is your own creative writing practice like? What is your background? Although I’ve worked across all the genres I write about in The Bloomsubury Introduction to Creative Writing, my practice has always been predominantly twofold: poetry and performance writing (though, oddly enough, never the two things together). Poetry probably runs in my veins. I am Persian, and poetry is so ingrained in our culture, our way of seeing the world, the rhythm of our breath. My mother is Pari Azarmvand Mokhtari, she is an expert on the poet Hafez, and she has memorized the entire works of several Persian classical poets. If you know Hafez, you know that all his couplets are completely unconnected from one another, and so to memorize almost 500 of his ghazals is literally a commitment. I began writing poetry as a teenager, like most other poets. Poetry is emancipating. It’s a way of breaking free of the literal and entering the infinite potential of the figurative. I found myself in poetry. Even now if I go six months without putting pen to paper, poetry is always the place I come home to. Finlay Lloyd Press published my first collection of poems in 2013; it’s called Anxiety Soup. Also, in high school, I was into drama. The subject, not the lifestyle. I had some wonderful drama teachers who allowed me to write plays for the advanced performance classes. Playwriting came easily to me. My plays were always surrealist in nature, and almost worked as an extension of my poetry. My bachelor’s degree was in communication and television production. It was at this point that I got more into screenwriting. My plays also incorporated some multimedia and film elements, so it was a natural next-step to start writing for screen. I work as a screenwriter on assignment sporadically, for producers in Los Angeles, London, New York, and Australia. And I’m working on a new collection of poems right now. Any parting advice for readers of The Bloomsbury Introduction to Creative Writing? Yes. If you’re a writer, write. Read. Work hard. Expect to keep working hard for a long time. Get a good mentor. When you’re ready, send work out to magazines and journals. Let rejections move you to send out more work. Build a publishing list. If you can bear to, do readings. Be involved in literary communities. Do freelance work, or work in a nonprofit or a start-up or another industry as a writer. Don’t feel that you have to put your name on all your industry work, you can keep that separate. Write to get better at writing. Write to finish the projects you start. Write to keep writing. And, always look after your relationship with the words. Tara Mokhtari is an Assistant Professor of Communication Arts and Sciences at Bronx Community College, USA, has taught creative writing, literature, and communications at universities in Australia and the United States since 2007, and is the author of Anxiety Soup. The second edition of her textbook The Bloomsbury Introduction to Creative Writing is now available from Bloomsbury.